There are a lot of great upgrades in iOS 8 but this one is my favorite. 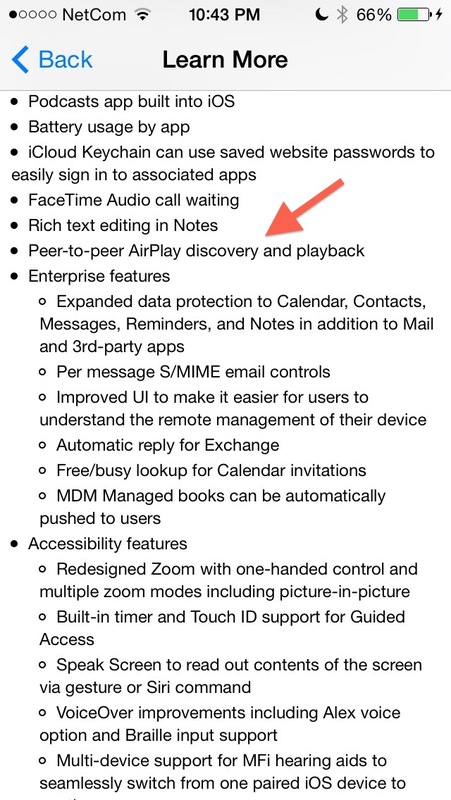 For years I have been saying that Apple should provide a way to do “ad hoc Airplay” (like AirDrop) and now they finally have done it. You can now connect to an Apple TV that is close to you, regardless of if you are on the same WiFi network. This is huge for schools that use multiple SSIDs to segregate groups of users for security reasons but have wrestled with the fact that AirPlay previously only worked when users were on the same subnet. AirDrop, as many of you know, allows Mac/iOS users to wirelessly share files with people physically close to you. What you may not realize is that you can share a file with someone close to you that is not on your WiFi network. This is useful because many file-sharing protocols are limited to people on your WiFi network, but AirDrop uses another “channel”, above your plain old WiFi network, to share files. Now this works with AirPlay as well. 1. I realize that some people used other methods to make AirPlay work across subnets before so you may not be too excited. For example I know that Xirrus Wireless systems have a settings that allows Airplay to work across subnets. 2. If you previously used separate SSIDs to segregate users and Apple TVs please don’t forget that is now “broken”. For example, your students can now select an Apple TV that you may have previously limited their access to by ensuring they were on another subnet. Overall this is a great step for schools and for Apple. Good luck with things and please let me know how this new change works out for you! ← Our house in boxes.